Bit Tooth Energy has a look at developments in high speed rail in Europe and the US - High Speed Rail - Europe and the American Election. It was President Obama who famously said, after the 2008 vote that “Elections have Consequences.” Well two years later that dictum still applies (as it will two years from now). I bring it up since (h/t to Luis) the European Commission has just released a report on High Speed Rail which gives some of the progress that has been achieved on that continent since the first high speed line was inaugurated between Florence and Rome in 1977, though it was not until the service between Paris and Lyon in 1981 that the boom began. And now Europe has 3,861 miles of high-speed lines where trains can travel at faster than 150 mph (the fastest is over 220 mph in commercial service, 350 mph in trials). The inter-continental service is continuing to grow, though to facilitate progress the EU is seeking to develop common technical standards across the network. Unfortunately, after Tuesday, the prognosis is not that favorable to the change in the United States. 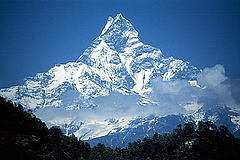 It will be a considerable boon in Europe, as expansion continues. Spain, for example, is planning on expanding the network so that 90% of the inhabitants are within 30 miles of a station. The results can be seen with the reduction in travel times between major cities. (And remember that the stations generally lie in the heart of the city, not an hour or so away as many airports now are). The advantages of HSLs, in terms of frequent connections (which can easily be modified depending on demand) and flexibility for passengers, have allowed the railways to compete more effectively against other modes of transport. Since 1997, over 6 million passengers a year have been using the Brussels–Paris HSL. As a result, flights have been cut back on this route. Overall the growth in traffic has been a six-fold increase in usage. Since high-speed lines were introduced, the number of passengers opting for this mode of transport has constantly increased. The number of passengers on all German, Belgian, Spanish, French, Italian and British lines increased from 15.2 billion passenger-kilometres (bpkm) in 1990 to 92.33 billion in 2008. 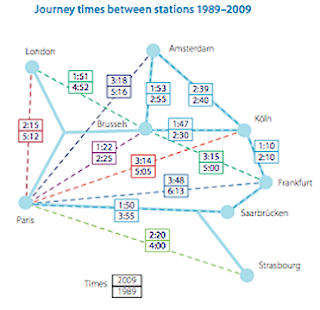 In looking at door-to-door travel times, the report chart shows that air becomes faster than conventional rail at a travel distance (in Europe) of around 240 miles, while air does not become faster than high speed lines until a distance of about 500 miles. I start to think about flying instead of driving at a distance of around 300 miles. Although the environmental impact of HSLs can also be reduced by improving the energy efficiency of trains and working on other elements of the vehicle, the carbon foot- print of rail travel is still much smaller than that of air or road travel. In the case of a journey from Paris to Marseilles, CO2 emissions in grams per passenger-kilometre (g/pkm) are just 2.7 g/pkm by HS train, compared with 153.0 g/pkm by air and 115.7 g/pkm by car. From the point of view of energy efficiency, HSTs also perform better, using 12.1 grams of petrol per passenger-kilometre, compared with 17.6 for conventional trains, 18.3 for a coach, 29.9 for a car and 51.5 for an aircraft. So how does this tie into the first paragraph? Well in the United States, and a part of the Stimulus from the Federal Government, high speed lines had been proposed, with funding from Washington. However, with the election of Republican governors in several states due to receive that money, the plans may have to change. The new governor of Wisconsin, for example, has vowed to kill the high-speed line between Madison and Milwaukee. This was meant to be part of a network that would run from Chicago to Minneapolis, and stopping the project will likely cost the state money and jobs – but as a top campaign issue it is likely something the Governor-elect may have to follow up on. Similarly in Ohio, the incoming Governor, John Kasich has said that “Passenger rail is dead in Ohio.” In this case he was discussing the $400 million plan to restart passenger service between Cincinnati, Columbus and Cleveland. Work on the high-speed Florida link has already started, this is expected to carry up to two million folk a year from Tampa to Orlando or back, by 2015. It was not favored by Rick Scott who was just elected Governor of the State, though some of his opposition may come from the investment needed to extend the link from Orlando down to Miami. However the incoming Chair of the House Transportation Committee has already spoken out against it. On the other hand the fate of the investment in a high-speed link in California has not been changed by the election. The backbone of that system, the 500 miles from LA to San Francisco is planned for completion by 2020.